Update: The State Department has no records of a meeting with the father of the shahid. The killer’s slightly less insane father visited Congress and the State Department. So perhaps they are assimilating after all. A horror for one woman, via text. Despite her SIOA Facebook page being restored, Pamela Geller has been banned from Facebook for a month. Reddit also seems to be under the impression that if you don’t mention Islamic terrorism, its victims are still alive. An exceptional essay by Bruce Bawar on the hard truths our leaders categorically reject. John Schindler examines our country’s most pressing epidemic, Jihad Denial Syndrome. Today it’s worth remembering those who were the first to expose the deep connections Islamic immigrants living in central and southern Florida had to international jihadism. 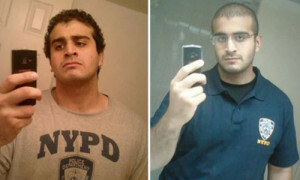 Adnan Shukrijumah was not the first, and unfortunately, Omar Mateen will probably not be the last. A co-worker complained that the guy who just murdered 50 people had threatened to kill people. Sound familiar? It should. Obama’s America, isn’t it grand? As a bonus, Mateen’s firm provided security to federal buildings. The first victims have been identified. What’s Facebook’s response to a Muslim jihadist murdering 40 innocent people in a gay night club? Banning a page critical of Islam, natch! Looks like the Merkelization of the Internet has begun. Proud Afghan immigrant and Taliban supporter Seddique Mateen. Watch the live press conference held by local officials. A word of caution from Rita Katz of the SITE Intelligence Group. Mateen was a licensed security officer who claimed ties to international jihadist groups. Unsurprisingly, his wife was the victim of spousal abuse. Some of the mosques surrounding Pulse Orlando. I wonder how many vigils they’re going to hold in the week ahead? The official news wire of ISIS has taken credit for today’s jihadist attack. The perpetrator allegedly recited Islamic prayers during the attack. The Daily Beast has published an exclusive on Omar Mateen, the son of Afghan immigrants-previously investigated by the FBI-who was responsible for the Orlando massacre earlier today. Read it in full. Father Mir Mateen told NBC News that the sight of two men kissing angered his son. A Twitter user raises an interesting point about how gay-friendly Orlando truly is, at least within its Islamic precincts. This entry was posted on June 12, 2016 at 12:09 PM and is filed under Analysis, News and Analysis. You can follow any responses to this entry through the RSS 2.0 feed.